Long before the Palace boys assembled their Wayward Boys Choir, and the girls of the Skate Kitchen had taken to the sidewalks of New York, Mark Gonzales was blazing a trail for a new generation of skaters to come. Taking his skateboard off the ramps and out onto the streets of cities around the world, Gonz – as he’s better known – is one of the scene’s most revered figures, fusing performance art with ollies and kickflips, and bringing skating to a wider audience over the course of the last 30 years. This year marks the 20th anniversary of an avant-garde performance Gonzales presented with Johannes Wohnseifer in Germany, as captured by filmmaker Cheryl Dunn and documented in short Back Worlds For Words, alongside footage of him hitting the pavements of NYC. According to Gonzales, the project was coincidental, and followed a chance encounter with Dunn. “I met Cheryl in NYC in the mid-90s,” he explains. “She was hanging on the steps of where Equinox is now, on the corner of Spring and Prince Street. I was leaving my buddy Harmony Korine’s place, which was right there at 68 Prince, and I just started talking to her.” The two became friends, with Dunn – who’s known for her gritty, lo-fi documentation of youth and subcultures – often following Gonzales around and shooting him skating in the years that followed. Now, to celebrate the film’s anniversary, a re-edit has been released, as the skater recreated his original performance at New York’s Milk Studios. Cut with clips from the 1998 version, the short also heralds the release of a new sneaker, designed in collaboration with adidas Skateboarding, who he’s been working with for 20 years. 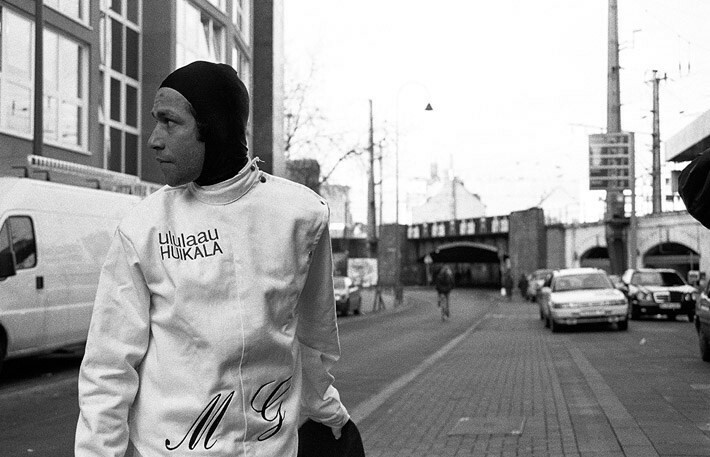 The Aloha Super nods to skate’s roots in surfing, with panels made from the material used in fencing suits – a reference to the costume Gonzales wore as part of the art piece. Watch the original 1998 film below, and the 2018 cut above. The Aloha Super drops online and in stores August 18.